"She would come over to me and snuggle in whenever I started playing for her." A little rhino was just a day old and her life was already in danger. In addition to the major threats all rhinos face, like rampant poaching for their horns, there are also the dangers of nature that the animals have to contend with. 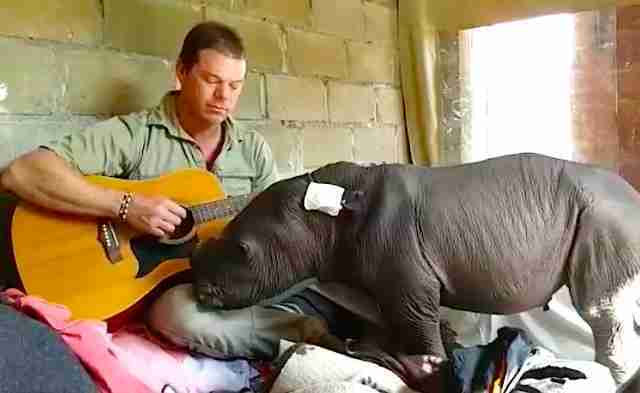 And this baby rhino, as sometimes happens, was rejected by her mom soon after birth. 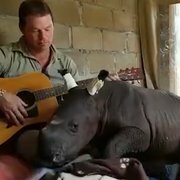 "We don’t know why the mother rejected the calf, but this does happen from time to time," Mark Mills, who was working at Care for Wild Africa's rhino sanctuary in South Africa when this infant needed help, told The Dodo. Rescuers rushed to save her and give her milk so she wouldn't starve. 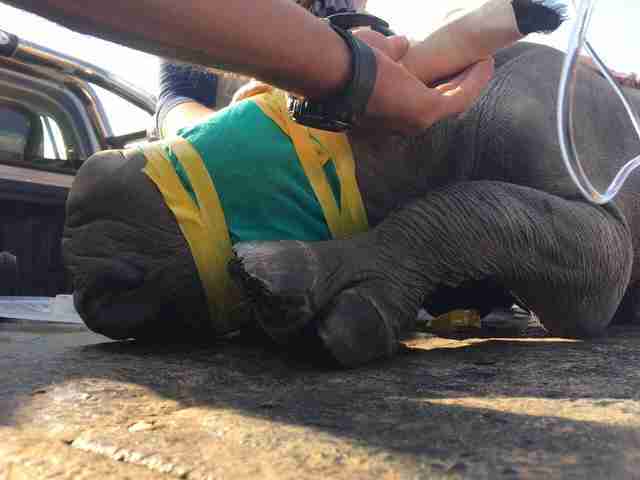 Without the help of her rescuers, the little rhino wouldn't have survived. But the basic necessities aren't the only things that help animals (including humans) stay strong. And that's why Mills decided to do a little something extra for the baby as she was trying to recover. Mills normally lives in Australia with his wife and two sons, but he's been thinking of the plight of rhinos in Africa for the past 15 years. Finally he decided he needed to go help. "The reason that I went to Africa for six months was because I wanted to do my bit to help the response to the rhino poaching crisis," Mills said. "The poaching epidemic has reached crisis levels." Most of the babies the sanctuary takes in are orphaned because their mothers are killed for their horns. While this baby's story was a little different, given the crisis facing the species, the survival of every baby rhino helps ensure a future for the animals. And Mills was determined to help the infant rhino stay strong physically and emotionally. "She was very young when she came in and was very fragile," Mills said. So Mills got out his guitar and started to play a song he and his old bandmates wrote years ago — and it seemed to help her feel calm. "I played to her several times to help her settle to sleep," Mills said. "She would come over to me and snuggle in whenever I started playing for her." Mills has just returned to Australia. "Although it was very hard to be away from home for so long, my wife is the person to thank for my being there," Mills said. "Without her support I wouldn’t have done the work I did." And Mills's work helped the baby rhino survive those first dangerous days. Now she's getting stronger with every day that passes. To help the rhinos rescued by Care for Wild Africa's rhino sanctuary, you can make a donation.